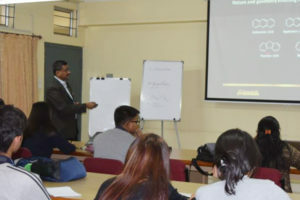 A Short Term Training Programme on Nanotechnology christened “Amazing Nano 2019” was conducted from 25th February to 2nd March 2019 by the Center of Excellence in Nanotechnology (CoEN), ADBU & Dept. of ECE, SoT, ADBU in collaboration with IASST, Guwahati and IIT Guwahati. On day-1 (25th February, 2019): The six days long STTP started with an inauguration in which we all seeked God’s blessings for a success completion of the workshop. Prayer was led by Rev. Fr. Joseph Nellanatt, Pro-VC, Assam Don Bosco University. Father also welcomed all the participants and asked them to take full advantage of the workshop in all terms. After that the Convenor Prof. Sunandan Baruah, Director, Cente of Excellence in Nanotechnology, Assam Don Bosco University, gave the overview of the STTP. Followed by that our Chief guest of the program Shri K. Baruah, Director NIELIT shared his thoughts to inspire the participants and also declared “amazingNANO-2018” open. The inaugural function also witnessed the release of the first issue of nanoFlash, e-magazine of the Center of Excellence in Nanotechnology (CoEN) at Assam Don Bosco University. Released by Shri. K. Baruah, Director NIELIT, Fr. Joseph Nellanatt, Pro-Vice Chancellor of ADBU, Dr. Navajit Saikia, TPO, Assam Engineering College, Dr. P. K. Boruah, Gauhati University and Prof. Sunandan Baruah, Director, CoEN at ADBU. After that the first technical session was taken by Dr. Indrani Dakua, Associate Professor, Dept. of ECE, School of Technology, Assam Don Bosco University. Her deliberation was on “Introduction to Nanotechnology and Basics of Material science & Nanoscience”. On the same day the post lunch sessions were taken by Dr. Sunandan Baruah, Professor, Dept. of ECE, School of Technology, Assam Don Bosco University. The topics covered was Synthesis of nanomaterials. Day-3 (27th February, 2019) The day started with breakfast. The first session on different rules to be followed in a chemistry lab and a brief idea about the lab sessions and the idea generation session those would be conducted were taken by Mr. Bikash Agarwal, Sr. Asst. Prof., Dept. of ECE, SoT, ADBU and Mr. Arnab Sarkar, Scientific Assistant, Dept. of ECE, ADBU. The entire batch of participants were divided into eight small groups and turn wise all the groups studied and did hands on synthesis of ZnS and Gold. They also were given demonstration of in-house designed contact angle measurement instrument and along with thin film depositor machine. The different teams discussed and brain stormed their out of the box ideas to put them in a organized format. As these ideas will evaluated on the last day of the STTP. Day-4 (28th February, 2019) was a visit to IIT Guwahati in the Central Instrument Facility and Centre for Excellence In Nanoelectronics & Theranostic Devices. Pre-lunch the participants got the opportunity to see many sophisticated instruments like Atomic Force Microscope (AFM), Scanning Electron Microscope (SEM), X-Ray Diffraction (XRD) Spectroscope, Single Crystal XRD, UV-VIS Spectrometer etc. in the CIF. 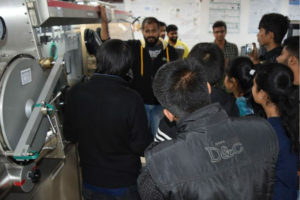 The participants were also introduced to the organic electronics lab in the CIF facility where they were exposed to the organics way of designing and fabricating photo voltaic cells. Post lunch participants visited Centre for Excellence In Nanoelectronics & Theranostic Devices where they were given introduction to different facilities like Molecular printing system, Raman Spectrometer, Confocal Microscopy, Electron spinning device, Thermal evaporation etc. Day-5 (1st March, 2019) Mr. Dipjyoti Sarma, Senior Asst. Professor, SoT, ADBU and Mr. Arnav discussed the use of ImageJ and Origin for analyzing different parameters like particle size and band gap determination. They did a hands-on session on the tools. After this a session was taken by Prof. Somobrata Acharya, Center for Advance Materials, Indian Association for Cultivation of Science, Kolkata. He mentioned about how nanomaterials can be used for energy generation, consumption and preservation. His talk was on “Nanotechnology towards Energy Applications”. The session was through skype. Pre-lunch session was taken by Mr. Kumaresh Sarmah, Assistant Professor, Gauhati University, who dicussed the prospects of nanotechnology in the field of research, entrepreneurship, jobs and higher studies. Post lunch sessions was taken by Dr. Neelotpal Sen Sarma, Associate Professor, IASST, Guwahati. He explained the participants about nanoparticles and its effect on polymers. The next session was taken by Dr. Devasish Chowdhury, Associate Professor, IASST, Guwahati who in his deliberation mentioned about carbon based nanomaterials. 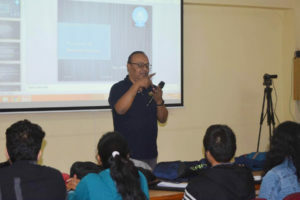 Day-6 (2nd March, 2019) started with a talk by Dr. Achintya Bezbaruah, Associate Professor, North Dakota University, USA, on “Issues of nanotechnology”. It was also a skype session where the participants interacted with Prof. Bezbaruah on different issues related to nanotechnology and on different burning research areas. The second session was taken by Mr. Arup Borah. Scientific Officer, IIIT, Guwahati. In this a hands-on session on how to design electrodes using pcb was delivered. The participants were also given a live demonstration on the imprinting and etching process to do device fabrication. In the post lunch session the evaluation of the ideas generated by different groups were done by Prof. Sunandan Baruah and Dr. Indrani Dakua. The presented ideas were very futuristic and also some of them were very socially relevant. In the valedictory function the participants expressed their views and experiences on the workshop and the certificates were given out by Dr. P. K. Boruah, Gauhati University. Prof. Sunandan Baruah announced the winners of the idea generation competition and Mr. Arup Borah gave away the prizes. The workshop was declared close with a vote of thanks from the Co-Convenor.